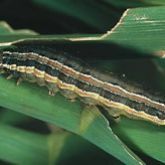 The armyworm's name describes the way larvae march in large numbers away from sites where their food has run out. Mature larval stages will sometimes march into cereal crops in late winter and cause serious damage, particularly on the edges of paddocks. Larvae shelter during the day and emerge after sunset to feed. hindwings are light grey with dark edge (dayfeeding), or pale and shiny (lawn). can be highly mobile (dayfeeding, particularly when overcrowded). laid in masses up to 7 layers deep that can be covered in fine scales. 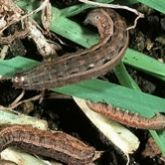 Other armyworms (e.g. Sugarcane armyworm (Leucania stenographa) and lesser armyworm (Spodoptera exigua)), cutworms and helicoverpa. 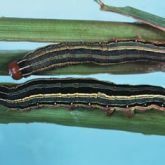 Common armyworm: barley, oat, wheat, native pasture grasses and perennial grass seed crops. Northern armyworm: sorghum, maize, barley, wheat and rice. Dayfeeding armyworm: mostly grasses, but also sugarcane, maize and sorghum. Lawn armyworm: barley, grasses, nut grass, oat, wheat and most lawn grasses. Larvae feed on young leaf tissue, giving the leaf margins a tattered appearance; heavy feeding leaves only the midrib. Crops directly seeded into standing stubble can be severely defoliated during the vegetative stage. Dayfeeding and lawn armyworms can strip leaves up to 45cm from ground level. Older larvae can cause significant damage by feeding on the green stem below the head (severed heads fall to the ground and cannot be harvested). Barley is most susceptible to head damage. Oat is also attacked but the less compact seed head means less damage. In northern Australia, wheat can also be damaged, but in the south the wheat head stays green later; armyworms feed along the heads rather than sever the whole head. larvae usually develop through 6 instars (stages) but sometimes 7.
larvae will feed during daylight. Larvae pupate in chambers that they construct in the soil. Moth flights occur in September and October, and some species can migrate long distances. Large numbers of armyworm moths attracted to farm lights on warm nights in September and October provide the first warning of potential outbreaks. sample at dusk for best results, if monitoring with a sweep net. Leucania sp. : 2 larvae per square metre for barley. Other cereals are likely to tolerate slightly higher numbers. Dayfeeding armyworm: more than 90% of plants are infested and more than 70% have significant (>75%) flag loss. Lawn armyworm: rapidly expanding areas with more than 60% leaf loss. Natural enemy activity usually ensures that outbreaks are only one generation. Predators include frogs, cane toads, birds and various species of sucking bugs. Ichneumon wasps lay single eggs into armyworm larvae or pupae. Apanteles sp. lays multiple eggs inside the armyworm larvae and pupates in a cluster of small oblong fluffy white cocoons near the dead host. Tachinid flies lay eggs on the skin of the armyworm larva, and the maggot develops internally—the fly pupa is found within the armyworm pupa. 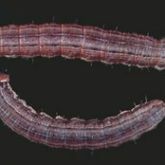 Larvae are subject to fungal (Nomuraea rileyi) and protozoan (Nosema sp.) diseases, but infection is widespread only in large populations and usually too late to prevent damage. Larvae affected by nuclear polyhedrosis virus (NPV) hang in an inverted ‘V’ from the plant and liquefy internally. An entomopathogenic nematode (EN) Steinenema carpocapsae is available commercially for use in turf in Australia. spray during late afternoon, as most species feed and are active at night. assisting plant recovery with generous applications of nitrogen fertiliser and water to lawns and pastures.